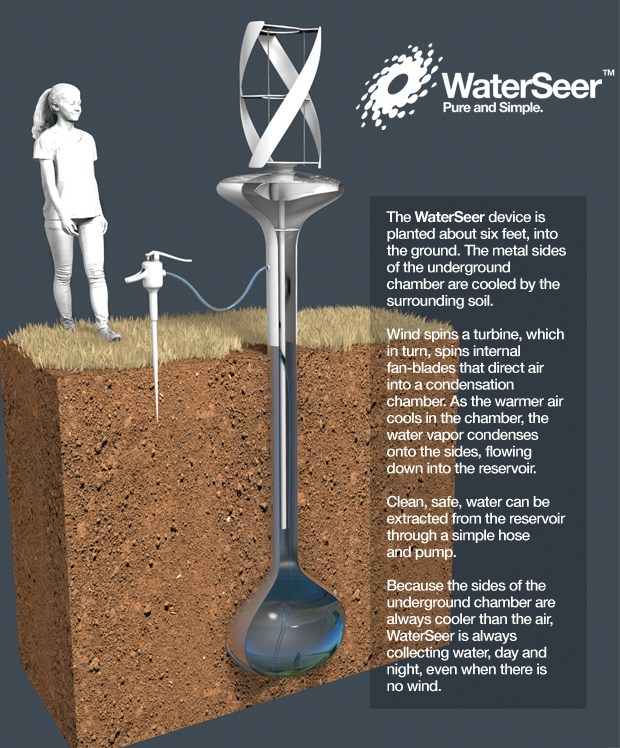 The WaterSeer is relatively simple device, designed to be operated without an external power input, and without the need for costly chemicals or maintenance, that can 'pull' moisture from thin air and condense it into water using the temperature difference between the above-ground turbine and the collection chamber installed six feet underground. The potable water can then be delivered to the surface for use via a simple pump and hose, and the device is said to be able to produce up to 11 gallons per day, even in arid regions. On the face of it, the device described in the video seems to be possible in principle, but thinking about it a bit more brings up some questions. Has this device been proven to work? Are the claims correct? I can't give a complete answer.That would require original research and/or actually testing a unit for an extended period of time. But some of the statements on that page aren't correct and weaken their claims. I'm going to focus on a single one. That link includes this picture. "because the sides of the underground chamber are always cooler than the air ,waterseer is always collecting water day and night, even when there is no wind"
The bolded claim is simply false. A few feet underground the average temperature is (roughly) the average temperature at the surface over recent times (actually a fraction of a degree higher than the average). It's affected somewhat by things like soil water content. Generally the greater the depth the longer term the average is. This graph shows something similar to above but it's more crowded. Even 4 feet deeper than this device soil temperature is higher than air temperature for significant portions of the year. During the day in summer the soil will be cooler than the air, during the winter or at night it will be warmer (mostly). That's not entirely bad, I expect people need water the most when it's very hot in summer but at night don't expect this to work very well. 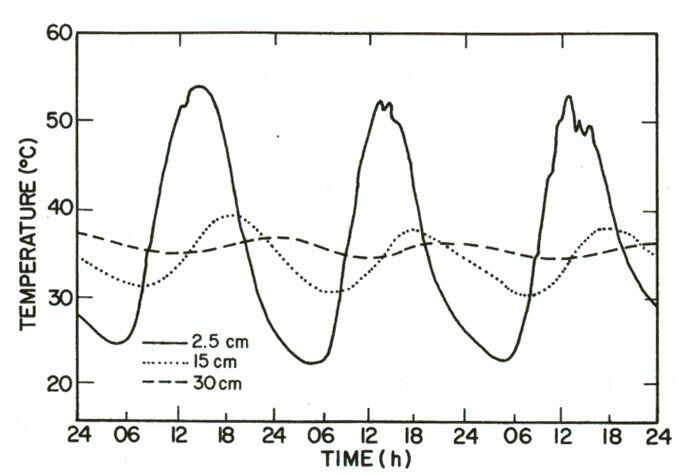 Water carries a lot of latent heat of vaporization and so you'd expect the soil around the chamber to warm up pretty rapidly to close to air temperature. You're basically taking advantage of the temperature difference but evening it out at the same time. The more water you harvest and the faster you harvest it the faster you'll warm the surrounding soil to close to air temperature. So be wary of any "tests" or short term demonstrations which show that it can harvest X amount of water in a day. They may be early on while the soil is at it's coldest vs the air before the machine has run for any significant time. If you had a small chamber 6 feet underground containing a small gasoline heater and burned 3/5ths of a galleon of gas each day every day to warm the surrounding soil you'd be in about the right ballpark. Not the answer you're looking for? Browse other questions tagged physics environment water sustainability . Can bullets fired into the air kill a person when they fall? Can energy be extracted from the vacuum? Can an on-the-fly water electrolyzer linked to the air intake improve fuel efficiency of a gasoline engine? Can you breathe underwater using bubbles of air? Can current flooding in California end the years-long drought? Can you extract over 500 gallons of water from the air a day for a few cents per bottle?